At the moment you are viewing Flexzion Pet Stroller Dog Cat Small Animals Carrier Cage 4 Wheels Folding Flexible Easy Walk for Jogger Jogging Travel Up to 30 Pounds With Rain Cover Cup Holder and Mesh Window which is one of our numerous available strollers from the make Flexzion. Select this wonderful stroller right now or browse through our store for other similar options. With the stroller you can walk your pet everywhere. 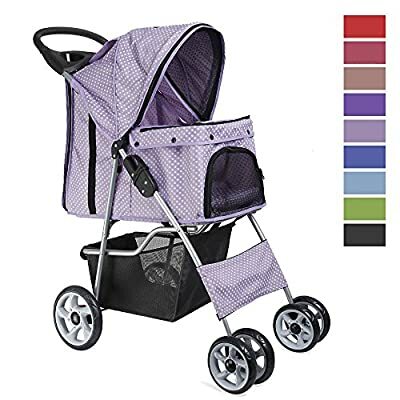 This feature packed pet stroller not only lets your pet ride around in style and comfort but also has plenty of storage space if you are stopping off at the groceries store. And there are two cup holders on the stroller. With good quality oxford it can be used longer. Whether you are going out for a long walk or just going to the shopping mall, this pet stroller will make your life and the pet's life easier and more comfortable. It can be folded and thus space-saving storage if you donnot need to use it. Open Size: 33"(L) x 14.5"(W) x 38.5"(H). Folded Size: 33.5"(L) x 17"(W) x 8"(H). Cargo Measurement: 21"(L) x 13.5"(W) x 20"(H). Weight Capacity: 30LB.